Citing 33 safety issue failings, at the end of April Ukraine’s nuclear regulator took the decision to suspend operations at Unit 2 of the South Ukraine nuclear power plant by a May 12 deadline, the date marking the end of the plant’s design lifetime. Under the terms of the Ukrainian State Nuclear Regulatory Inspectorate Council’s decision, should the state-owned nuclear energy operator Energoatom wish to resume the unit’s operations beyond its design lifetime it will have to implement all necessary measures by May 2017. Yet the same Unit 2 reactor remains part of Ukraine’s energy arithmetic for this year’s winter period. As the Ukrainian government has no ‘plan B’, Bankwatch member group the National Ecological Centre of Ukraine (NECU) is concerned that both the operator and the regulator are likely to be under pressure to restart the unit before winter, in spite of the various safety deviations and modernisation measures pending at the unit. Four nuclear power plants, with 15 reactors, generate almost half of the electricity supply in Ukraine, and the country is almost completely dependent on Russia for nuclear fuel supplies as well as the treatment and storage of two thirds of its spent nuclear fuel. Yet the welcome South Ukraine 2 decision from the regulator, coming just days after the 29th anniversary of the Chernobyl disaster, has increased attention on the wisdom of Ukraine’s ongoing lifetime extension programme for its Soviet-era nuclear reactor fleet – a programme supported by a related ‘safety upgrade’ programme that involves key financing support from the European Bank for Reconstruction and Development and the European Atomic Energy Community (Euratom) totalling EUR 600 million. Three of Ukraine’s nuclear energy units are already operating beyond their design lifetime, and nine others, including unit 2 of the South Ukraine power plant, have been slated for similar permissions from the state nuclear regulator by 2020. One of these units granted a ten-year lifetime expansion in 2013 is Unit one at the South Ukraine plant. However, a NECU study published in March this year (pdf) revealed dangerous vulnerabilities at Unit one, including observed wear in a number of elements in the reactor vessel that already exceeds tolerable levels by a factor of ten. Moreover, according to NECU, there have been abuses of international law at play in the implementation of the lifetime extension programme. 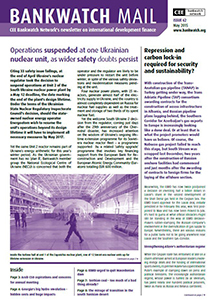 Reactors one and two at the Rivne nuclear power plant had their licenses renewed in 2010 without proper assessment of the environmental and health impacts in either Ukraine or neighbouring countries, a violation of the Espoo Convention (the Convention on Environmental Impact Assessment in a Transboundary Context) to which Ukraine is a signatory. The Espoo Implementation Committee has gone on the record in recent years to criticise the Ukrainian authorities for their failure to meet their obligations, and it has also emerged that neighbouring countries were not even consulted on the potential impacts of the lifetime extensions, in breach too of conditions attached to the EBRD-Euratom loan. 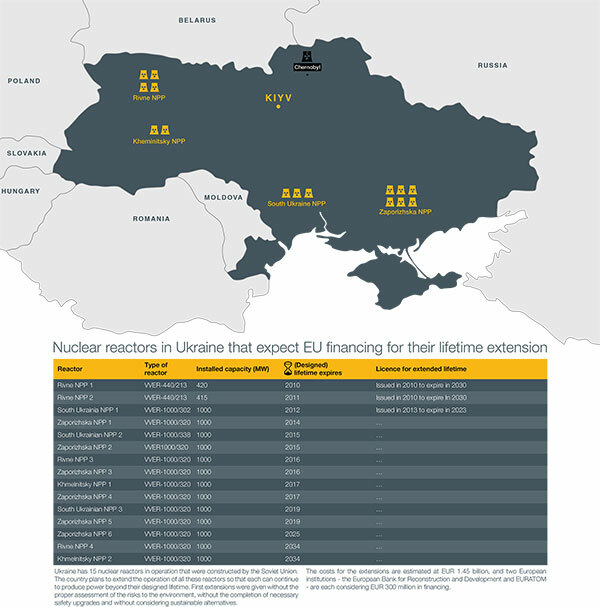 Nuclear reactors in Ukraine that expect EU financing for their lifetime extension. Bankwatch groups in the neighbouring countries – Bulgaria, Hungary, Romania, Slovakia and Slovenia – have in turn been requesting a more pro-active approach from their governments. 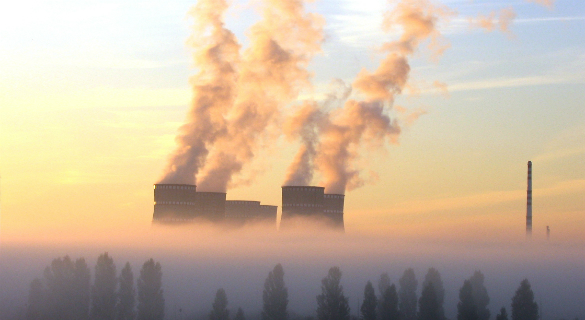 Open letters have recently been sent to national environment ministries alerting them to the life extension decisions being taken for South Ukraine Unit 2 (now suspended), followed by Zaporyzhska 1 in December this year. The neighbouring country groups have also urged their national representatives at the EBRD to push for suspension of the bank’s support for upgrading Ukraine’s nuclear plants until a cross-border assessment is carried out. Ukraine’s ongoing nuclear safety saga should also be seen in the context of the development assistance now being offered by the EU and others in the name of international solidarity. “Deep and systemic reforms” in Ukraine are stated as a key goal, with energy security, supply diversification, transparency and the rule of law in the energy sector high on the agenda. Yet such ambitions are being put at risk by the lifetime extensions project, not to mention wider European security. Truly “systemic” reforms could be effected by internationally supported efforts to gradually phase out Ukrainian nuclear reactors, with replacement of them by safer and more effective alternatives as well as much-needed, sharp improvements in energy efficiency.